Love Dr Crittenden. Her energy is awesome and she thoroughly examined me. She made sure I was comfortable and was quickbut patient. Great visit! Love Dr Crittenden. Her energy is awesome and she thoroughly examined me. She made sure I was comfortable and was quick but patient. Great visit! Dr. Crittenden was amazing. This was my first well woman exam and she totally put me at ease. She answered allmy questions and also recommended a few things. I would refer my friends and family to her with complete confidence. Dr. Crittenden was amazing. This was my first well woman exam and she totally put me at ease. She answered all my questions and also recommended a few things. I wouldrefer my friends and family to her with complete confidence. 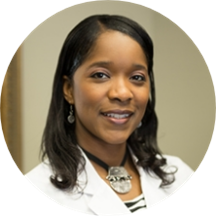 Dr. Kimberly Crittenden, M.D., provides premier obstetrics and gynecology care to women throughout the San Antonio area in a caring, friendly, and attentive environment. Absolutely great doctor and fun too talk too, Never awkward! She was very attentive and I felt very relaxed with her. I really appreciate that she understood my need and concerns and gave me the best options for my lifestyle. I had been to several different OB-GYNs before I found Dr. Crittenden and she is the absolute best! Concerns that I had, other doctors had brushed off as if they were no big deal. With Dr. Crittenden, I only had togive her a brief overview of my concerns before she was on the same page with me and gave me a clear action plan to address them. She switched practices in the last year and I followed her to her new one. I will always come to Dr. Crittenden as long as I am in the same geographical area! Mrs. Crittenden has delivered both my children and she is the absolutely the best doctor. She always so sweet and very caring. I would recommend very woman to go and see her. The office staff was rude. Also they have a no children rule and you have to pay for parking. I had results given to me with an explanation to take medicine but got a call with a different result and explanation.An order was placed for me to come back but no follow up date was set. Doctor was pleasant but visit was not.